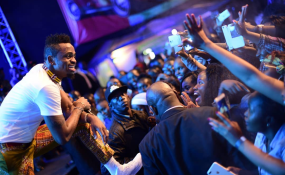 Through Baraza la Sanaa la Taifa (BASATA), an organization tasked with regulating entertainment events and review of entertainment content in the country, said Diamond was prevented from leaving the country because he failed to obtain a license from the body to go perform outside the country. Acting Director of BASATA, Onesmo Mabuye, confirmed the reports, stating that the organization had to stop Diamond’s trip because he had flouted the newly introduced regulations. Mabuye said they wanted their action to stop Diamond from boarding for not being cleared with BASATA to be a lesson to other artistes. “Regulations for an artiste to have a license whenever he wishes to perform abroad is not something new. It’s been there. It’s for the good of the artiste. We have to know where one is heading to showcase his/her work so us to ensure we offer enough protection to them if something bad happens. For Diamond he didn’t see this as important as it was when processing his Visa,” Mabuye told TBC TV. According to the said new rules, any Tanzanian artiste wishing to perform outside the country has to seek clearance from BASATA and upon returning he or she has to report to the body as well. With his Comoros trip cancelled, Diamond, who is known to charge not less than Sh5 million for international performances, has been left counting huge losses.